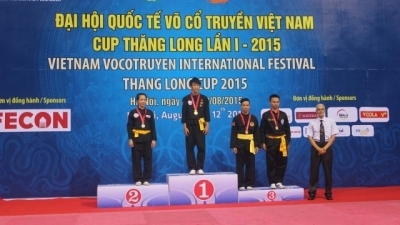 NDO/VNA – The first international Vietnamese traditional martial arts championship concluded in Hanoi on August 11 after three days of competition martial arts championship. The Vietnamese team outperformed 29 foreign countries and claimed first place at the event with 41 gold, 36 silver and 77 bronze medals, followed by Russia and Belarus. The Vietnamese team gathered athletes from 13 cities, provinces and units nationwide, including Hanoi capital; Bac Ninh, Hung Yen and Hai Duong provinces in the north; the central provinces of Binh Dinh and Khanh Hoa; and An Giang, Binh Duong and Dong Nai in the south. The international teams hailed from the US, Australia, France, Belgium, Germany, Italy, Russia, Spain, India, Myanmar and Laos. Speaking at the closing ceremony, General Secretary of the World Federation of Vietnam Traditional Martial Arts Nguyen Manh Hung said the championship, the largest of its kind, is intended to preserve and promote the traditional culture, patriotism and sportsmanship of the people of Vietnam. Through the event, the organisation board aims to introduce Vietnamese traditional martial arts with international friends, he said. The event was co-organised by the Vietnam Olympic Committee, the Hanoi Department of Culture, Sports and Tourism and the Vietnam Traditional Martial Art Federation. An example of national heritage, Vietnamese traditional martial arts have developed throughout the process of national construction and defence and are highly popular among Vietnamese people as a way to stay physically healthy and mentally focused, in addition to being a form of self-defence.